This is it. The last day of our Winter Sale and our final Daily Deal. It's your last chance to save big! And today's Deal is big. Save 40% on a set of pure cotton tea towels with a chic design - a great hostess gift for anyone who likes her java! 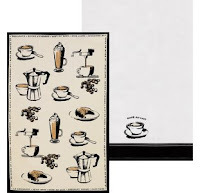 These pure cotton printed tea towels bring a touch of Parisienne style to the kitchen - because life's just better with coffee! Cafe au lait towel is printed and embroidered. Made of 100% cotton. Designed in Canada.